I am happy and pleased to have author, Linda Wisdom stop by to discuss her latest book. 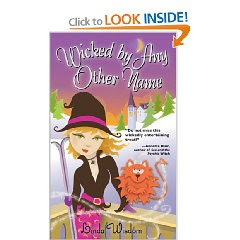 Stasi Romanov is the sweet witch from the class of 1313 at the Witches Academy. Stasi Romanov is the kind-hearted witch. Stasi Romanov is the witch loyal to all. Stasi Romanov is there for her friends. So what happened? Why did she lose her temper and be ready to pretty much zap her surroundings? First, she was served with papers that she was to be sued in Wizards Court because she allegedly gave a human customer a hexed sachet that guaranteed the woman’s cheating husband wouldn’t return to her. Was that a good thing? That’s for Stasi to know, if she did it, that is. To make matters worse the plaintiff’s wizard attorney is gorgeous! We’re talking surfer dude type and the last thing she wants is to lust over the enemy. There’s just one problem. The guy’s wearing red hearts over his head and Stasi has the same red hearts over hers. Cupid’s way of letting them know they were meant to be together. You’d think that would be more than enough for a witch to handle. Pile on that the lake in her town is harmed by olde magick. The upcoming lunar eclipse coupled by Mercury Retrograde affects the townspeople that are now looking at her as the new version of the Wicked Witch of the West. And what about Samhain coming up where the veil between the living and the dead are the thinnest and the town’s ghosts like to return and hang out? No matter how nice you are, would you really be able to keep your cool and continue to be a wonderful witch if all this was going on in your life? Or would you think about coming up with some creative hexes to put a few people in their place? What would you do? And if you want to see how Stasi handles this, pick up a copy of Wicked By Any Other Name. Thanks to Danielle with Source Books, I am giving away a copy of this book to one lucky winner. To enter leave a comment for Linda with your email address. This contest will end March 7th. Hearts over their head? Ahh, if only it were that easy to find the right one! please enter me in the drawing. I just love the cover art. Sound very cute. I'd like to win a copy. That sounds like a great book. It's original, I have to say! Not the usual teenage/witch/spell book. I like it! Attempting to be nice and not lose your cool? Now that's something I can definitely relate to. This one looks like so much fun. Please enter me in your giveaway. This was a very fun book to write and I hope you all enjoy it. I totally judge books by their cover, so this one hooked me, but your info, Cheryl, helped clinch it. Please enter me! Cute! I'd like to read it, hopefully. This series has also been optioned for film or TV and I'd love to see the witches on either screen. Congratulations on being optioned, Linda!! Wow! I'm wishing I could put hexes on people today. Most definitely. No need to enter me; I'm dropping in to say thanks to Cheryl for the e-mail. I've posted about this witchy time at Win a Book. Linda, if we can help you get word out about anything else, drop us an e-mail! I cannot believe this is the first time I have heard of this book. Its sounds cute and funny! Please enter me. Oh, this sounds like a cute and fun read. Extra points since it is about witches! Please enter me in the contest. Sounds like a great book and I'm loving the cover! What a fun sounding book - please enter me in the drawing. I'll send you info on my book signing then. Thanks all! I like to think all my witches are the kind you'd love to hang out with. Being a witch sounds like fun. I can't wait to read the book! I always seem to enjoy books with witches as main characters and lately have gotten into paranormal comedies, so this book sounds great! Thanks for the chance to win. Please enter me. I have been wanted to read one of Linda's books and this one sounds great. I've loved your other books and would love the opportunity to read this one! Your writing is wonderful! Thanks all! Magick and humor go together very well for me. Please include me in your drawing. It sounds like a great book. This book sounds like fun. I would love to read it! This book sounds like fun. Thank you for the giveaway! I love that you include Samhain in this book! I loved 50 Ways to Hex Your Lover and would love to read this book! This sounds like fun. Please include me in your drawing. I love any opportunity to put another book on our shelves. Please enter my name. I just found your blog and I can't wait to look around. Please enter me to win too! Please include me in your drawing. Sounds like a great book. What a unique concept for a witch book! I'd love to win a copy. Great blog! Thanks all for stopping by and checking out Linda Wisdom's latest release. I am sure you will all love it. This book looks like something I would read, would love a chance at winning! This book sounds really good and entertaining, and I love that cover art. Enter me please. Thanks! This sounds like a great book. Love the cover art too. Oh, I would love to read this!! Sounds fun! Thanks! Count me in as someone who would love the opportunity to read this book! There is a few people I'd like to put a hex on! This sounds like such a fun book. Nice giveaway. I am a gook addict and would love a chance to read this. This sounds like a great book! If only Cupid did make it that easy to find the right one! Thanks for the chance to win a copy. This looks like just the funnest book to read. Thanks for the giveaway. Please enter me. This sounds great. In fact, I've heard great things about all your books. =) I'd love to win a copy. Sounds great!!! Thanks for the chance!! The book sounds great. I love the front jacket cover. Thanks for the giveaway. Love the synopsis. It sounds like an enthralling book. Count me in.